I had a ghostly visit ironically on All Souls Day – November 1st. I don’t usually have these sort of visits. And they had sort of died down – no pun intended there. I can tune into spirits when asked, but it was never my thing. And it wasn’t until about 6 months before I got pregnant that I started seeing ghosts just pop in without any reaching out on my part or being in a haunted house, etc. It started at the Grove (of all places) a busy outdoor mall in Hollywood that my deceased father appeared next to me. I was sitting down waiting for my husband who was shopping inside (talk about role reversal) and just relaxing. All of a sudden I felt someone pull up the chair next to me. When I turned to see who it was – there was no one there, but I felt my father’s presence and he materialized. We had a nice conversation and he continued to follow me around for several years. He died when I was ten and I’d never been contacted by him before so it was really a major surprise to say the least. I asked why he was there (turns out he was there to deliver my kid from the other side and warn me that I might die but that’s another story). So back to my main story; the ghosts were around for the year before my kid and a couple of years after. It had been a while since I had an unexpected visit. But to my surprise I was listening to NPR and all the back and forth about how tight the election was – how it might take weeks to get a count, etc. And I just was thinking to myself I didn’t believe it at all. I got out of my car and saw my aunt. Actually an old conservative Republican in life but now a much happier, more relaxed spirit. She was laughing and told me that indeed I was going to turn out to be right. And the part of the statement I had heard that “Obama is going to win the election but it’s going to be a real nail bitter even though it shouldn’t be,” the part about “it shouldn’t be,” always confounded me a bit. Did they mean that Romney was such a lesser man, or it wasn’t in Romney’s fate or that shenanigans were going to make the race tighter than it actually was? I really couldn’t tell and since that statement I had been trying to decode it. I finally came to the understanding that it was all of the above and to this my Aunt affirmed as did her mother (my grandmother) whom I had never met in life. They were both giddy and excited about all of it and some other things that they were vague about that seemed to be related to me and my family, but anyway – just VOTE and remember you count. And WE the PEOPLE will win this time. Our next goal will making sure it stays that way. I guarantee you Obama’s win will push the zealots on the right to even greater extremes and after exploiting all the racism – next will come the intense misogyny and attacks on women’s rights. However the women of this nation will not go quietly into the night. I am starting to believe that the discovery of Eris will be about this very thing – feminist revolutions due to the attempts of those in power who will continue to try to control and take women’s rights away. Problem will be for them – we won’t go quietly into the night and if anything this very issue could be the impetus for the next wave of revolutions – guerilla style. I will save all the visions I’ve been having about this subject for after the election. ERIS is here and she isn’t going away. For now we will enjoy our victory – those who want a level playing field and democracy for all. But always remember how fragile our democracy has become and how easily corrupted. It has only been because of the work of some decent people in government that we don’t live in a theocratic plutocracy (BTW Romney would pretty much cement that path having been a BISHOP in his church and a solid Plutocrat.) It will be vitally important now more than ever that PEOPLE really be INFORMED and know history, educate themselves and stay active in politics or we will be conceding our nation to the corrupt and all that has been positive about our legacy will be seen through the dirty glasses of a very dark history. Best to all and to all a great voting day! OK, it’s getting weird. The stars seem to be aligning among all the countries I’ve looked at in a major way, we are talking intense radical changes. Pluto will be hitting Russia’s Uranus in the 2nd house around 2013 but before it does Saturn will be conjuncting Russia’s natal Moon in the 10th again changing the way they do business and hitting them hard in the pocket-book. They too will change laws regarding how they do business which will eventually negatively impact world markets (not immediately but several years down the road). This will happen in the next couple of years. It seems that the end of the “recession” oops did I say recession I meant mild depression, isn’t over. It will be hitting China and Russia in a harder way this coming year. And they will do some radical things to change how they work and do business as transiting Saturn will be squaring Russia’s Capricorn stellium in the 2nd house of work, money and stuff. This could destabilize them and lead them into a foreign war as Pluto and firstly Saturn inconjuct Mercury and then Jupiter in the 9th. The conflict will not be on their soil but overseas. Again, all signs seem to be pointing to a global crisis and/or war starting in the next few years. OK, I had the creepy dream about Israel just before I had a bunch of health stuff come up. In the mean time I described the mortar I saw in my dream to a reporter friend of mine and she told me that it was exactly as I described it. Basically, it looks like a giant bullet. 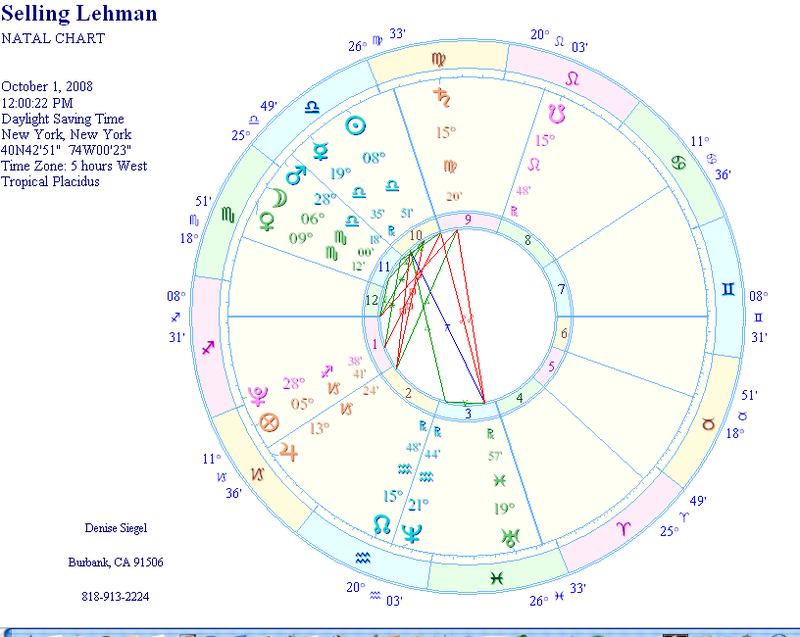 That just got me wondering what the hell is up with Israel’s chart? Why did I dream it would be the center of a war that would lead to a world wide conflict. Well, I figured astrology would help me figure it out and yeah, I looked at Israel’s chart and the transits about to hit and it didn’t look good. According to the chart transits leave me to believe that things will progressively become more difficult, more polarized and those who can see the writing on the wall will migrate out of the country. There will more than likely be an exodus and the involvement of an international tribunal or group that will oversee the conflict which may start as peaceful, more along the lines of international law and lead to international troops escalating to the point that the world will divide among two camps and a world war fought on middle eastern soil. I have a feeling the conflict will not stay in Israel. 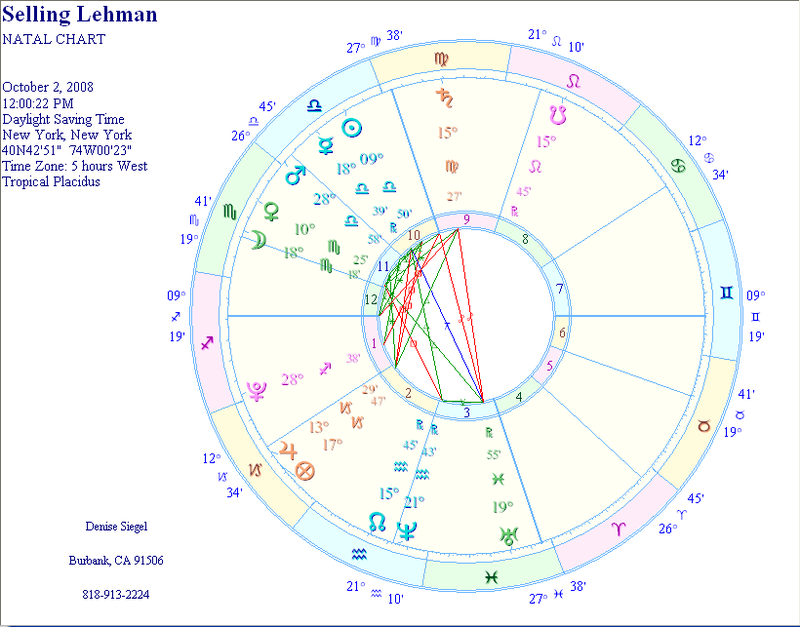 The great malefic Saturn will also be transiting Israel’s 12th house over the next couple of years and will eventually hit the natal Neptune which will trine Natal Mercury and sextile natal Pluto lessening the intense loss and restriction put upon Israel. It’s fair to say that Israel will have very powerful allies that will come to its aid in this upcoming period of instability. As good as this is for Israel it could be bad for the world. It could lead to conflicts between much bigger nations on Israel’s behalf which is where the WW more than likely will be triggered. I’m going to look into the other nations I feel will be involved in the conflict later on and report on that next. I have the feeling that what will start out as a seemingly benign investigation by the international community will take a volatile turn and incite old animosities which will lead to a much bigger world war. This won’t happen over night, but over a period of years as the planets march along and set off a series of bad aspects in Israel’s chart. Next I’ll look into the major power players charts and see how they interact with this situation. so what we’ll be seeing in dec will be worst than what we’re seeing recently from sept to october? Unfortunately, yes. I do get the feeling that over the next couple of years some major changes in how the markets work both here and internationally, along with some sort of restructuring and some new laws, will make the global economy stronger and less vulnerable to future problems. But it will get worse before it gets better. The aspect that set this chain off will go exact in December, so there will be as I said in the post, a tsunami. I used that metaphor because in a tsunami, at first you’re not sure what is happening, the ocean recedes, looks strange, but it doesn’t seem so bad, then all of a sudden your drowning. And just as it seems to be over, the water pours out again. So that is how I saw it playing out. It’s almost as if it’s not really happening, very surreal. I’m going to post, the Dow, NASDAQ, The US Constitution and the US Constitution’s signing chart so you can follow what I’m saying. If anyone is interested I have some basic astrological information, for novices on another blog, it’s url is: http://astrologybasics.wordpress.com if you want to ask astrological questions you can post your questions there and I’ll answer them. Looking at the Dow’s chart we’ll see the start of a downward spiral happening more behind the scenes (like it has been) then in our faces. But once Pluto crosses the ascendant in late January 09, we will really see the effects of what has been happening. Right now this Pluto aspect is going through the 12th house and although we’re seeing it, we’re not really seeing it yet. It’s not clear what all of this means and there is a lot of illusion and delusion about the stock market. But come late January we are going to be smacked in the face and it will directly start effecting us. My intuition is that we will see a many more companies go under, a lot more job loss/unemployment, a significant hit for retail stores — many of them will go out of business, and so many other companies are going to fall. We will also start to see a sharp rise in homelessness. There are a lot of factors at play here. In the US Constitution’s chart Pluto will be crossing the 7th house around March of 09, making our allies more vulnerable to economic turbulence than they have already felt. But around the same time Pluto makes the horrible aspect to the Dow it also inconjuncts Uranus in the second house of work, which makes me feel there will be a tie in to major job losses, and it will be sudden, out of the blue — so some industries that seem invulnerable right now will get hit. 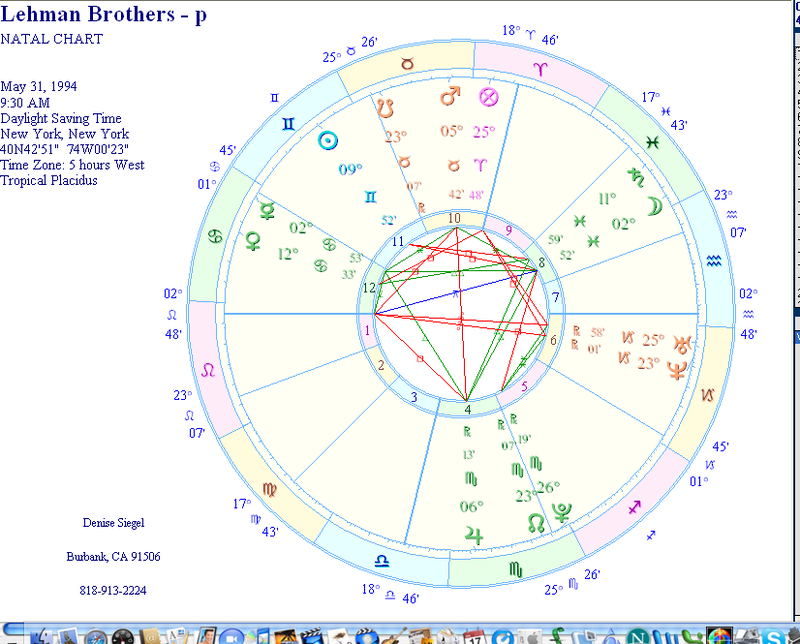 Pluto is also squaring the US Constitution’s part of fortune in Libra in the 4th house, again causing turbulence in the housing market. More people will loose their homes, and right now we are seeing a credit freeze in that area, this aspect will get worse in late November and into December. This whole thing is a giant mess. The more I look at all the charts the crazier it looks. 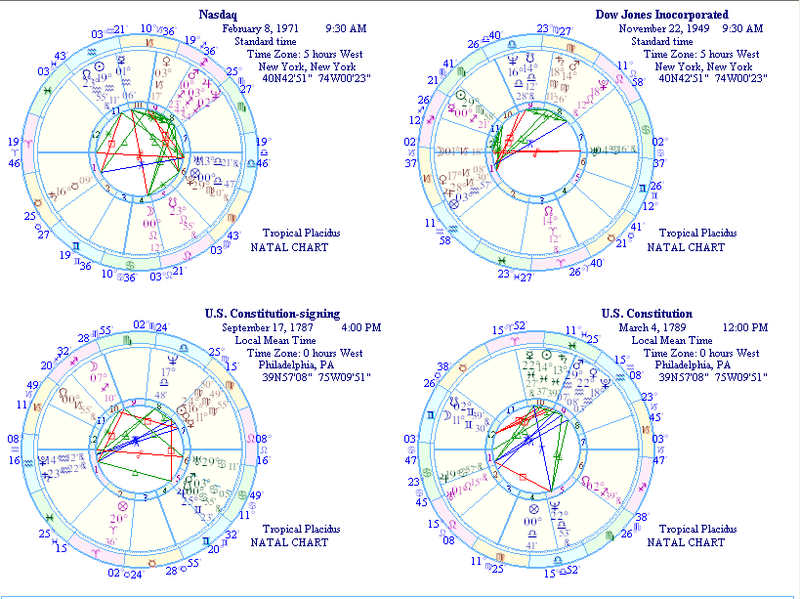 Also Uranus will make an exact conjunction to the natal US Constitution’s chart’s Mercury which rules the 4th house. I worry a bit about another terrorist attack during this time period (March of 09). We are really in for some strange times. But I also feel we are going to turn this around and find hope, courage and a great lesson in all of this. This will be a defining moment in American history for a bunch of reasons and I have an intense feeling most of us will rise to the challenge and it will bring out the best in us, and we will turn things around for the better. It may even wake us up about other issues such as global warming which really threaten the habitability of our planet, and makes our current problem small in comparison. So perhaps we needed this wake up call to get us all involved, engaged and thinking again, rather then checking out — something I feel we have been doing for a long time now. Hopefully, we will all learn that politics are important — the workings of which have a direct effect on our personal lives. Something we forgot when things seemed to be working OK.
We forgot the lessons of our ancestors who lived through horrible things, fought with their lives to not just give us our freedom, but to insure people would get paid a fair wage, and not be exploited. This is why unions were set up. Before their invention, our country was very much like China or Dickinsonian England where children worked 16 hour days for practically nothing, and no matter how hard a person tried they couldn’t make ends meet unless they came from the upper classes. We forgot that people died putting those unions together to make life better for generations to come, only for Republicans to sell us on the notion that unions just took money and did nothing. Granted, unions got fat and lazy, and not all of them lived up to their original glory. But without them or regulations or without all of us banning together by voting for our own interests instead of lobbyists controlling Washington — we are nothing. We are not a democracy, we are a corporate plutocracy. Nothing could have made that point more clear then what happened during the last two election cycles. Special interests and corporations had gained so much power while we were busy playing with our blackberries, that we hardly noticed they had bought the Republican party, sold it to the working poor via FOX News (Rupert Murdoch) and then had a coo that we paid for. But their party is over! That is the good news. We will pay the price for their greed and our laziness. But we will learn and will have the opportunity to truly be the great country we were meant to be. So vote, get involved and stay involved. We can’t let this happen again. The next few years are going to be hard for all of us, but we can change it. We can learn from this, and if we stick together, and help one another, we will never be stronger. In a post last week I talked about foreign intervention in the markets and a rally on wall street, I thought it would be toward the end of the week. I have a feeling this whole week will be good for those of you wanting to get out. Pluto is a karmic planet and the more our country and the world goes toward the politics of tolerance, understanding, intelligence and fairness, the better the world economy will get. I don’t know if any of you noticed, but when John McCain was up in the polls, the market took a dive. Now I’m not saying he is directly responsible, but as I said in an earlier post his chart is so bad for the Dow that if he won we would see, as I said before the difference between, “an economic Hiroshima,” in the case of McCain, as opposed to an “economic knife fight” if Obama wins. I truly believe that as we are headed into a double digit lead for Obama, we will see the Pluto aspect in December lesson. That’s my feeling right now. There is always choice. Fate vs. freewill this is a big debate in the astrological community. “Bad” charts and “bad” aspects can be used for good if the individual or the entity being read has been virtuous, true, and built a life of doing good. One can also avert disaster by making a change in the path toward these principles which I believe the American people are doing right now, but it won’t erase the karma we will have incurred, it will however soften the blow. So that’s the good news. The future is a path and as more go toward the positive, the better it will be for all of us. This being said, we will see some very unprecedented and bizarre times in the stock market over the next couple of years so if you don’t have the stomach for it, best to get out while you can. There is going to be a major restructuring of the world economy and the market place as a whole. So for the little guys like me, it might be best to play it safe. That’s what I plan to do. I’m personally am going to wait for the Pluto aspect (which takes several years) to pass before re-entering the stock market. I’ll keep you posted. One tip though, in about 2010 we will see the start of a good time to buy real estate and turn that around for a bunch of money in 6-8 years. Both the 1st and 2nd of October are good, but I think the 2nd is a little better. There are lots of trines and positive aspects both days but on the 2nd they are tighter. I would sell this stock before Pluto opposes its natal Mercury in February of 09. But even then it won’t be a total disaster for Lehman, a restructuring in their work force which will make people nervous of course on Wall Street. This stock looks better than most, I must say. But with everything going crazy I personally would get out of the stock market right now and maybe reinvest in 09 when the stock is down, if everything gets worked out with the stock market itself which is another story. Best luck and good wishes. 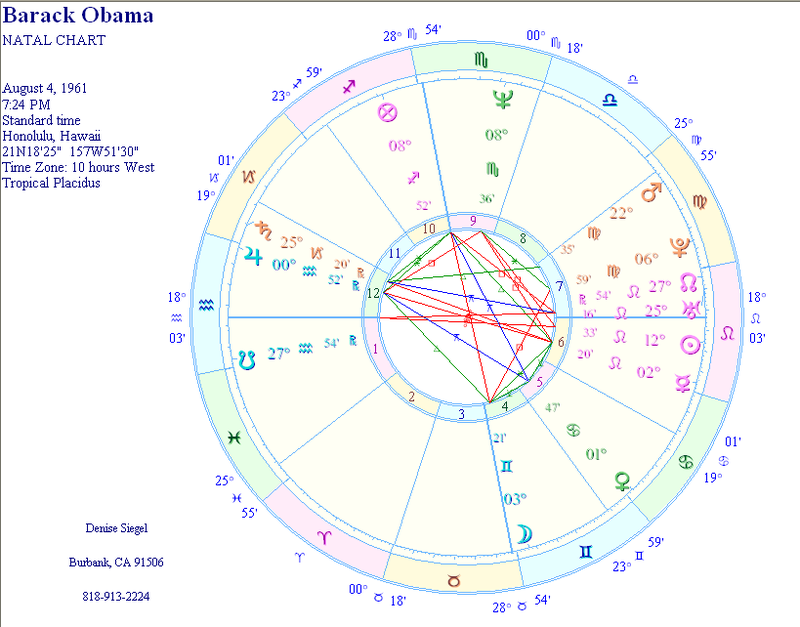 Barack Obama – his chart, who is he? It’s interesting to see how prevalent the 7th house is in the charts of politicians. As law makers it makes sense being that the 7th house rules courts and justice as well as partnerships, the public and open enemies. In Barack’s case we see a lot of 7th house action, his mind is defintely occupied with issues of fairness, equality and service. His Leo sun is reigned in by the 6th house of service so any bombast is tempered with his desire to serve coupled with his opposition to Uranus in the 7th and his Aquarius rising he has strong desire to serve humanity. With his Pluto in the 7th his partner is strong, as we know. And has great influence, as well as Joe Biden will. He takes into consideration other points of view and weighs them heavily in his decision making process. Moon in Gemini trine his Jupiter gives him a cool emotional demeanor and an understanding of both foreign and domestic people. His childhood would involve a lot of emotional ups and downs and moving quite a bit, this is also public knowledge but is indicated in his chart. His mother was an intellectual and teacher, (Moon in Gemini in the 4th) this created great opportunity for him to grow intellectually as moon trines his Mercury in the 6th. Again he puts his knowledge into serving the greater good. Not surprising he would become a community organizer as his need to serve is strong and taught him a lot about the world and himself. Mars in Virgo in the 6th again reinforces his desire to play fair and serve others in the process which is probably why he was attracted to law. but the kind of law he was interested in and is interested in is focused on workers and their plight, those that serve others, he identifies with them which is part of his passion to serve. He has the ability to think outside the box (Aquarius rising) but this is balanced by many factors in his chart which enable him to think in gradations of color as opposed to the black and white world of someone like Sarah Palin who has a proponderance of fixed signs and too much Aquarius in her chart leading her into the realm of magical thinking and the inability to listen to others, this quality often referred derogatorily as “a know it all,” is not present in Barack Obama. His chart is balanced with all the elements and enough mutable signs to offset his fixed sun and rising. He is strong in his convictions without being married to his ideas, able to amend his position to changes that come along when necessary and capable of listening to a good case and changing his mind to fit the facts and circumstances. His emotional center is his home life, his wife and children, and his mother. Jupiter in Aquarius in the 12th making a trine to his moon will ultimately be a great benefit, just as the chips look down for him luck strikes and fate helps him along. All in all he is compassionate, service orientated, humanitarian and extremely intelligent, if this makes him an elitist then we should all be so lucky as to be called this. His excellent aspects make him capable in many ways, not just his general intelligence, ability to understand the working person, his service oriented personality but also he understands finances not just the big picture but the details of the economy. Notice the trine between Saturn in Capricorn in the 12th and Mars in Virgo. He understands what is going on behind the scenes, things we the public do not see and knows how to fix this via legislation, Mars in the 7th in Virgo. It’s no surprise that the top wealthiest among us those in the top one percent fear him because he is not going to be a giant help to them but rather to us, the everyday people who work for a living. He has many enemies in that elite group and it will be no surprise that they will pull out all the stops to make sure he’s not elected including resulting to fear tactics (geared to the naive) which will more than likely be their main focus in trying to take him down. But alas, he does have Jupiter there to save him. So he does have hidden forces who support him and luck on his side. He will restore our good name in the world and put our economy back on track and with all the Virgo in his chart he will reform health care for the betterment of us in the middle class. So make sure to vote!